In the world of luxury absolutes are rare. What is the unquestionably the most luxurious hotel in the world? Which is irrefutably the most luxurious car? Which Savile Row tailor is without shadow of doubt the most luxurious? In Champagne there is no such ambiguity: Krug is unquestionably, irrefutably and without a shadow of doubt the most luxurious. 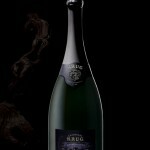 Krug don’t produce Champagne – they produce Krug!